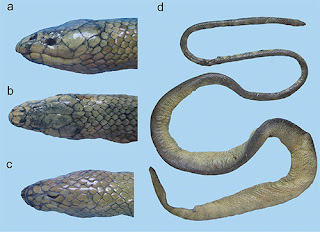 Calamophis jobiensis Meyer, 1874: 135. Holotype: MTKD 1026, destroyed in World War II. Type Locality: Ansus, Yapen, Indonesia. Brachyorrhos jobiensis – Peters and Doria,1878: 371. Distribution: Known only from type locality on Yapen Island, Indonesia. Diagnosis: This diagnosis is based on a translation of the original description: 164 ventrals and 10 subcaudals. Upper labials six; third and fourth enter orbit, eight lower labials, one preocular, one postocular; pentagonal internasal contacts rostral with one side and penetrates between prefrontals; subcaudals divided.